Where do ghosts come from? I don’t mean, from which plane of paranormal existence—which spirit world, as it were—but where and how did ghosts originate in our folklore? 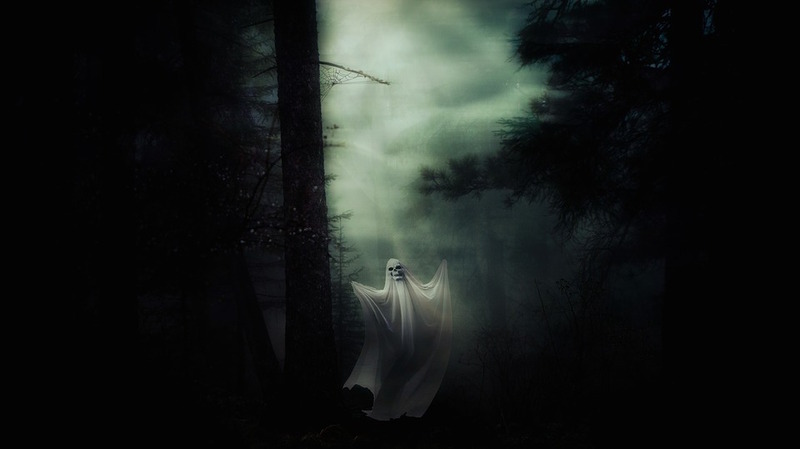 Cultural anthropologists may never answer that question definitively, but I have an idea, based on Neuroscience, how the very first ghostly apparitions paid our distant ancestors a visit. The billions of nerve cells dwelling inside your cranium are a lot like tiny rechargeable batteries. In most cases, these cells won’t tire enough for you to notice, but with careful observation, you can catch them napping. Neurons are reservoirs of electrical charge. When stimulated, a neuron sends an electrical signal and then needs some time to recover. During a resting phase—which can last 10 seconds or longer—other active nerve cells continue to fire. In most instances, this neural trade-off is seamless, and your brain doesn’t detect the shift of activity from one neuron to another, but once in a while too many nerve cells expend too much energy too quickly and cause perceptual glitches. We tend to experience these glitches as optical illusions, and sometimes as ghosts. The following demonstrations show you how to trick some of your neurons into recklessly expending most of their energy at once, so you can detect them when they’re in the act of recuperating. Stare at the green ghost on the left 30 seconds, and then shift your gaze to the gray rectangle on the right. While you were staring, a battle was raging between the neurons in your brain that sense green and magenta, which mutually inhibit one another in a process called “color opponency.” On the grey rectangle, you should see an afterimage of a magenta ghost with green eyes. This particular ghostlike afterimage arises because, while staring at the green-bodied ghost on the left, color sensitive neurons in your visual pathways grew tired of the intense activity of responding to highly saturated colors. And this fatigue was highly localized. Neurons that respond best to green were fatigued only in the green segments of the image, while neurons that respond best to magenta, grew tired only in the ghost’s eyes. Because visual neurons that respond best to green “oppose” (inhibit) those that respond to magenta, and vice versa, when you look at a chromatically neutral patch of gray after fatiguing green and magenta sensitive neurons respectively, you will see opposite complementary colors to those of the original image. In essence, the magenta afterimage of the ghost’s body arises because “green neurons” grew tired, so the rested “magenta neurons” won the never-ending neural tug of war between the two colors. Similarly, in the eyes of the ghost, “magenta” neurons wore out, giving green neurons the upper hand. Ergo, greenish eyes in the afterimage.